One of the most requested recipes in my family is for our famous homemade buckeyes but this recipe is one that comes a close second. If you like the peanut butter and chocolate combination of buckeyes, you need to try this recipe for buckeye cake. I’ve baked this cake for birthdays and holidays and dessert auctions (raising $290 just for this cake, thank you very much!). It takes a bit of time to create the various layers, but the ending result is definitely worth the time spent. The original buckeye cake recipe was the winner in a Toll House competition, and created by Krista Linegar. Once you bake this buckeye cake, you’ll see exactly why this recipe won! Our family quickly fell in love with this recipe but have since tweaked to make it even better. 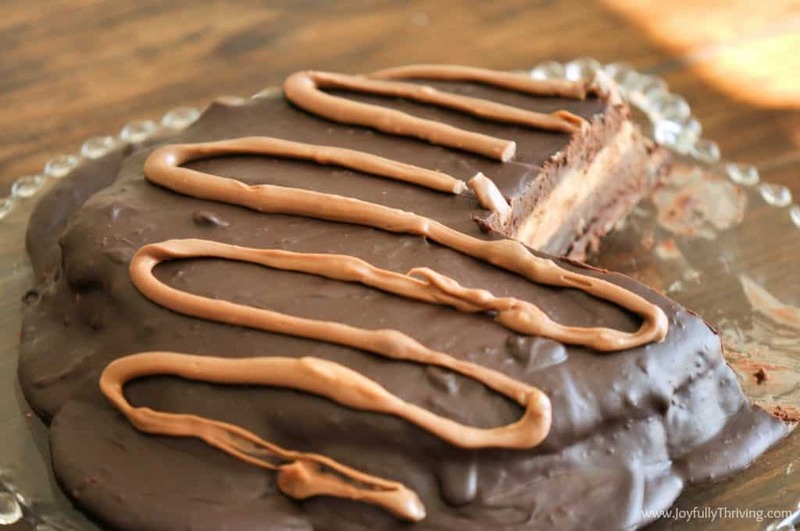 Buckeye cake consists of three parts – a brownie like cake on the bottom with a peanut butter fudge layer that is topped by a rich chocolate ganache. For as rich as this buckeye cake tastes, it is actually simple to bake. Yes, there are a couple steps to follow but it is well worth your time to make this buckeye cake. Make it once and I am confident your family will enjoy this decadent cake as much as we do! For the cake layer, you will need the following ingredients. For the peanut butter fudge layer, you will need these ingredients. Finally, for the chocolate ganache layer that tops the cake, you will need these two ingredients. To begin, preheat the oven to 325 degrees. Grease a 9-inch-round cake pan. Line the bottom of the pan with parchment paper; grease again. For the cake, beat eggs and sugar in large bowl. Stir in flour, melted butter, cocoa, and vanilla extract until smooth. Pour into prepared pan. Bake for 25 minutes or until a wooden pick inserted in the middle comes out clean. Cool on wire rack for 5 minutes. Run knife around edge of cake; cool for an additional 10 minutes. Invert cake onto serving platter. Remove pan and parchment paper; cool completely. For the peanut butter layer, beat peanut butter, butter and vanilla extract in medium mixer bowl until combined. Gradually beat in powdered sugar. You can do this with a mixer or by hand. Spread mixture on cake, all the way to the edge of the cake. Refrigerate for 30 minutes. For the ganache, heat the cream in small saucepan to boiling; remove from heat. Add semi-sweet morsels; let stand 5 minutes. Stir; refrigerate for 30 minutes or until mixture has thickened slightly. Pour chocolate on top and spread over sides of cake. Refrigerate until ganache sets and you are ready to serve the buckeye cake. When you are ready to serve your buckeye cake, I would recommend small slices as this is a truly a rich, chocolate dessert. I use butter but I don’t know that it really matters whether it is salted or unsalted. I’ve used both and the cake always tastes fine. Parchment paper (affiliate) really is necessary. It will make removing your cake so much easier! These parchment papers are great because you don’t have to worry about storing a whole roll for the occasional times you use it! 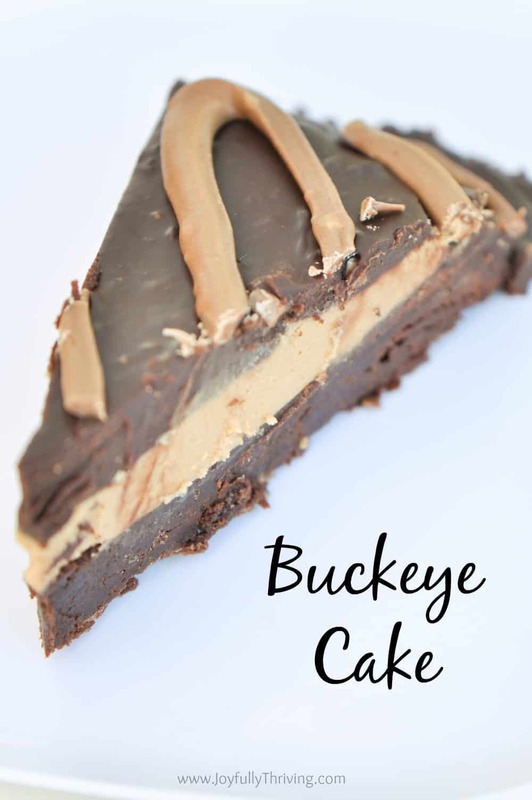 You can top the buckeye cake with swirls of peanut butter fudge for an extra garnish, if you so desire. I rarely do so but it does add a nice visual touch. Keep your buckeye cake in the refrigerator. Pull it out 15 minutes or so before you are serving it, so it is easier to cut. 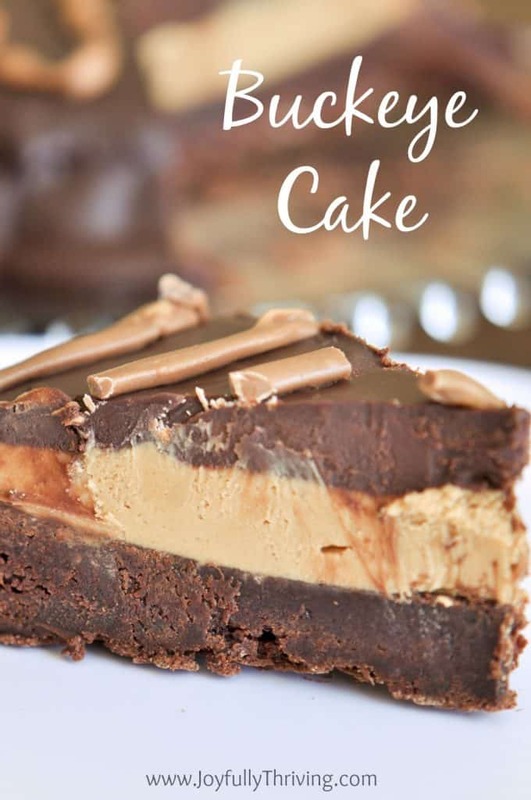 This decadent buckeye cake is the perfect combination of chocolate and peanut butter. It's just like the buckeye candy but only in cake form! For the cake, beat eggs and sugar in large bowl. Stir in flour, melted butter, cocoa, and vanilla extract until smooth. Pour into prepared pan. Bake for 25 minutes or until a wooden pick inserted in the middle comes out clean. Cool on wire rack for 5 minutes. Run knife around edge of cake; cool for an additional 10 minutes. Invert cake onto serving platter. Remove pan and parchment paper; cool completely. For the peanut butter layer, beat peanut butter, butter and vanilla extract in medium mixer bowl until combined. Gradually beat in powdered sugar. You can do this with a mixer or by hand. Spread mixture on cake, all the way to the edge of the cake. Refrigerate for 30 minutes. For the ganache, heat the cream in small saucepan to boiling; remove from heat. Add semi-sweet morsels; let stand 5 minutes. Stir; refrigerate for 30 minutes or until mixture has thickened slightly. Pour chocolate on top and spread over sides of cake. Refrigerate until ganache sets and you are ready to serve the buckeye cake. Oh my goodness, that looks and sounds sooooo wonderful! I will definitely have to try this one! This looks so yummy, it makes me want to bake one today! I can almost taste it. The ganache is my favorite part! Whoa!! This looks amazing! Love the peanut butter and chocolate combination! Oh dear, this looks so good! Plus, it would be EASY to convert to gluten free with the only flour being a small amount in the dense lower layer. This is totally going to be my next dessert! Yay! Happy converting, Janeen! It is SO delicious! I hope you and your family enjoy it!